« Working on big projects…the beans need to be counted! You may know how to cut things on your ShopBot ( or print them on your 3d printer) and feel like you just need a designer to email you drawings of the parts and pieces to be able to successfully fabricate their design. And that may be true, but communicating throughout the process will almost always make the process much smoother. We all know designers that just want to have their parts cut the way they draw them, without any feedback, but a smart designer will understand that while they may have a picture in their heads of what their design should LOOK like, they might not know as much about the fabrication process as you do, or may not see the process from the same “nuts and bolts” perspective. After a Fabber has worked with a Designer on several projects they each develop a better understanding of what the other brings to the table, but even after lots of successful projects, communication is critical. Fortunately modern technology makes that so much easier than in the past. *) Cell phones with cameras: Modern cell phones have fantastic cameras and are (almost) always connected to the internet, making it simple to snap a quick picture of a problem area or a detail that you might not be sure of and send it via email instantaneously, like the picture below. And in many cases a quick phone call will get an answer to a question that might take a handful of emails to be sure that everyone was on the same page. *) Adding eyebrows: Sometimes an email or even a phone call won’t accurately convey your question, or their answer. Frank Zappa said “The computer can’t tell you the emotional story. It can give you the exact mathematical design, but what’s missing is the eyebrows”. One way to add the “eyebrows” is using video chat, and the atFAB designers and I used Google+ hangouts pretty regularly, especially in the beginning. I could ask a question about a detail and Anne or Gary could hold up a laser-cut model and point to exactly the area that I was talking about. 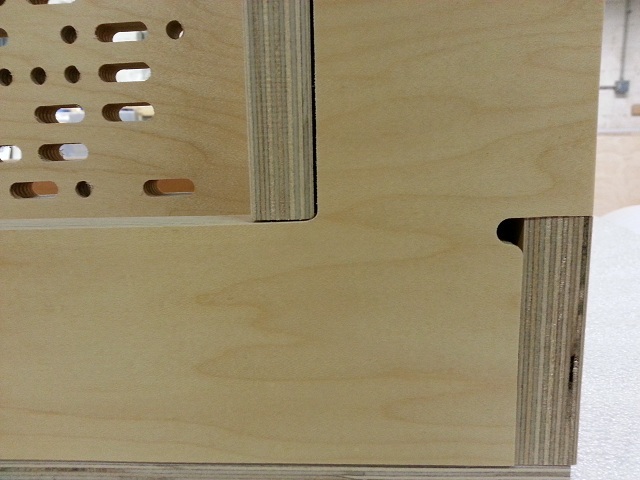 There was no question whether I was confused and thinking the back of a piece was the front…it was absolutely clear. *) 3d models: Sometimes the only thing that will convey an idea accurately is a 3d model, either of the whole part or just a detail in it. I’m pretty fast with Sketchup so tend to use it for these sorts of quick models, but any tool you’re comfortable with will do fine. The only thing to be careful of is to not get too wrapped up in modeling and adding too much detail…it’s a waste of time and most of the time too much is…well…too much! *) Cloud based storage: Services like DropBox, Gdrive from Google, and box.net are not only great for keeping track of cad and design files, but also can be handy for sharing images and all kinds of other files. For instance all the information for the parts labels that we printed was stored in a spreadsheet, created by Anne in Google Docs and shared on Gdrive. I could access it when I needed to print labels, and she could update it as pieces were added or parts modified. I don’t claim to be an expert on the subject, but over the years I’ve tried a handful of different webcams and types of software. I’ve ended up liking the Microsoft Lifecam webcams (Amazon link) the best , but the Logitech webcams worked almost as well in my experience. TinCam is the software I’ve liked the best with (like Sketchup) just enough features to do what I need, but not too many. 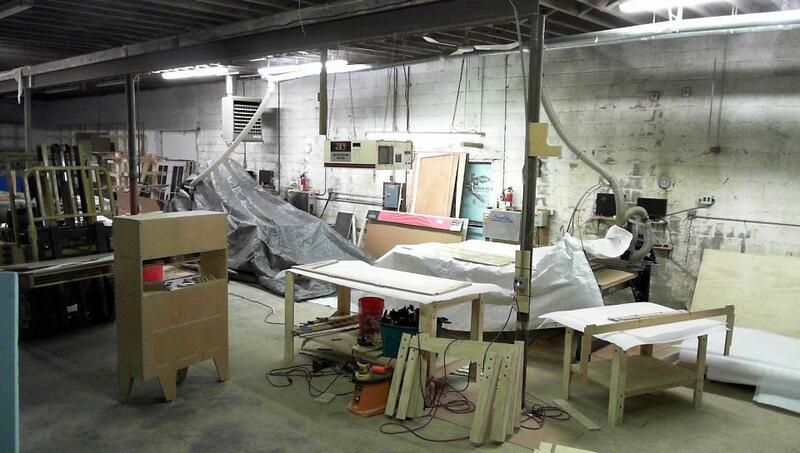 Most of the cutting for the MakerBot office furniture is finished and the parts are being assembled in the shop. Next I’ll show how they all turned out (very cool by the way!) and talk about the cutting process and how it went.